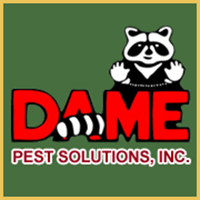 Welcome to Dame Pest Solutions, Inc., a full service pest control company. We treat and control your household pests, from RATS in the attic to ANTS in the kitchen. Our trained professionals will protect your home and family. Dame's treats customers really well and they are the best in the business. I will recommend them to anyone in need of pest solutions. Great service. Office very helpful. Love you guys!!!!!! And Sabrina!!!!!!!! They are always on time and available when we need them. Technician always pleasant. Always informs us want he has done & has found. Have always had a good experience calling the office. Joe was very professional and explained a lot to me about our particular issue. He was thorough and since his visit we have had no further evidence of the bugs we were having a problem with. I would recommend Dame to anyone. No issues w/ bugs since I have ordered this service. You know I would call if I wasn't. I never even think about bugs, you keep me safe! Service is fast and has always resolved our issues in a prompt manner. I was so impressed with their attention to detail, professionalism and friendliness. I will fully recommend this company to any and everyone. The young man Joe was such a fantastic representative of this stellar company.I have had no rodent situation since! They truly exceeded my expectations. Great treatment and follow up. Joe does an awesome job of explaining the different pests and solutions on Marco Island. I did receive a call about access through the house to a bait station upstairs. Unfortunately we are not in-state at this time. Will call on our return in mid-August. Everyone at Dame has been great. Very knowledgeable and helpful. We hope Joe the iguana whisperer is doing well! Great rental experience - however the drop off location in RSW is very far from the terminal. For Platinum - should be closer to where the cars are picked up. Great people and service. We appreciated the thorough explanations. First rate service. One perimeter application and no more millipedes! Thank you for helping us protect the sea turtles! Maura. HAD RAT INFESTATION IN MY MOBILE HOME WHICH I TRIED TO RID RAT TRAPS BUT DAME BUILT SCREENING AROUND THE FOUNDATION OF MY HOME AND NO MORE RATS!!! Everything is great so far.